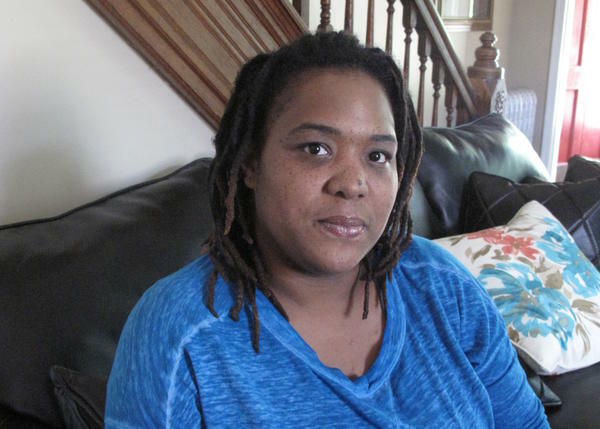 Lakisha Briggs, at her house in Norristown, Pa. Briggs, who was being abused by her boyfriend, lodged a legal challenge against her eviction for having the police called too many times to her former residence. Lakisha Briggs of Norristown, Pa., was one of those victims. When her boyfriend started abusing her several years ago, her grown daughter called the police. Before leaving, one of the officers warned Briggs that this was her first strike. She couldn't believe what she was hearing. "He just was like, we just gonna make sure your landlord evict you. And I'm like, my landlord evict me? For what? Like, I didn't even do anything," she recalls. But Norristown had what's known as a nuisance property ordinance. Her landlord could be fined and have his rental license suspended if police were called to the property more than three times in four months for "disorderly behavior." Unless, that is, he evicted his tenant. After that first warning, Briggs — who also had a 3-year-old daughter — was reluctant to call the police when her boyfriend beat her up. But one night, when they got into a fight, he slit her neck open with a broken ashtray. When she woke up in a pool of blood, her first thought was not to dial 911. "The first thing in my mind is let me get out of this house before somebody call," she says. "I'd rather them find me on the street than find me at my house like this, because I'm going to get put out if the cops come here." But the police did come, when someone saw her bleeding outside. Briggs was airlifted to the hospital. When she returned home several days later, her landlord told her that she had to leave. He said he didn't want to throw her out, but if he didn't, he'd be fined $1,000 a day. "I think it's almost hard for people to believe that the law would be used in this way," says Sandra Park, a senior attorney with the ACLU Women's Rights Project. Park says she doesn't think most lawmakers intend for the laws to target victims. "But unfortunately, we've seen in community after community with these laws, domestic violence victims and other crime victims do get punished, and I think we just need to be aware that this is the reality of what people are experiencing on the ground," she says. In the Briggs case, the ACLU sued, the federal government filed a fair housing complaint, and the Norristown law was eventually repealed. The state of Pennsylvania also passed a law to protect crime victims. But Park says similar measures keep popping up — in New York, Arizona, Wisconsin and elsewhere — as local communities try to get a handle on crime and safety. There are likely hundreds of such laws, although no one knows for sure. Amanda Grieder oversees compliance with a nuisance ordinance in Cedar Rapids, Iowa, and says that one problem the city has is that police officers end up being called to the same properties over and over again. "In addition to making sure that citizens in our city have the ability to live in neighborhoods free of nuisance activity, we also felt the need to recoup some of the costs of taxpayer-funded services," she says. Under the Cedar Rapids ordinance, landlords can be fined hundreds, if not thousands, of dollars for repeated police calls, unless they come up with a plan to abate the problem. Grieder says the city recently revised its statute and is working with social service agencies to make sure crime victims are not penalized in the process. "No matter what the circumstance, the No. 1 priority is we want you to call police, we want you to report crime," she says. The state of Iowa also has a new law to make sure crime victims are not discouraged from calling for help. But Park and others say, even with such exceptions, the ordinances can have a chilling effect on tenants, especially those who are low-income with nowhere else to go. Some abusers even use the threat of eviction against their victims, which is what happened to Briggs. "After he found out that I was on my last and final strike, he kind of just like moved into my house," she says. "It's like, you know, a really messed up situation because it's, OK, at this point, what do I do?" She definitely did not want to call the police. Since the Briggs case was settled two years ago, Norristown has taken a new approach to addressing nuisance properties. Municipal administrator Crandall Jones says police and other local agencies now work more closely with residents to try to address the underlying problems that lead to excessive police calls — such as drug trafficking, domestic abuse or mental illness. He says crime has dropped as a result. "That nuisance issue is really symptomatic and not the issue," says Jones. "When you're dealing with the symptoms and not the real issue, the symptoms are going to continue to reoccur and reoccur." For her part, Briggs no longer worries about eviction. She now owns her own home. In certain places around the country, victims of crimes, especially of domestic abuse, might be afraid to call the police. That's because of laws that are meant to control crime and nuisances in rental properties, and they do so mostly by limiting the number of times you can call the police. We're going to hear what a law like that meant for one victim. Just a warning here that this story includes a detailed description of violence. Here's NPR's Pam Fessler. PAM FESSLER, BYLINE: Lakisha Briggs Norristown, Pa., could not believe her ears. Her boyfriend was beating her up. The police were called, and now the officer was telling Briggs that this was her first strike. LAKISHA BRIGGS: He just was, like, we just going to make sure your landlord evict you. And I'm like, my landlord evict me - for what? Like, I didn't even do anything. FESSLER: But Norristown had what's known as a nuisance ordinance. Her landlord could be fined and have his license suspended if police were called to the property too many times unless he evicted the tenant. So after that first warning, Briggs was reluctant to call police when her boyfriend beat her up until one night. He slit her neck open with a broken ashtray. When she woke in a pool of blood, her first thought was not to dial 911. BRIGGS: The first thing in my mind is, let me get out of this house before somebody call - like, I'd rather them find me on the street than find me at my house like this because I'm going to get put out if the cops come here. FESSLER: But they did come once someone saw her outside bleeding. Briggs was medevaced to a hospital, and when she returned home several days later, her landlord told her reluctantly that she and her 3-year-old daughter had to leave or else he'd be fined a thousand dollars a day. SANDRA PARK: I think it's almost hard for people to believe that the law would be used in this way. FESSLER: Sandra Park is an attorney with the ACLU Women's Rights Project. She thinks most lawmakers don't intend for the laws to target victims. PARK: But unfortunately we've seen in community after community with these laws domestic violence victims and other crime victims do get punished, and I think we just need to be aware that this is the reality of what people are experiencing on the ground. FESSLER: In the Briggs case, the ACLU sued. The federal government filed a fair housing complaint, and the Norristown law was eventually repealed. The state of Pennsylvania also passed a law to protect crime victims. But Park says similar measures keep popping up in New York, Arizona, Wisconsin and elsewhere as local communities try to get a handle on crime and safety. Amanda Grieder oversees compliance with a nuisance law in Cedar Rapids, Iowa. AMANDA GRIEDER: One of the goals in addition to making sure that citizens in our city have the ability to live in neighborhoods free of nuisance activity, we also felt the need to recoup some of the costs of taxpayer-funded services. FESSLER: Which is why landlords there can be fined hundreds if not thousands of dollars for repeated police calls. But Grieder says the city recently revised its statute and is working with social service agencies to make sure the victims are not penalized. GRIEDER: No matter what the circumstance, the No. 1 priority is we want you to call the police. We want your report crime. FESSLER: But Park and others say even with such exceptions, the laws can have a chilling effect on tenants, especially those who are at low income with nowhere else to go. Some abusers even use the threat of eviction against their victims, which is what happened to Briggs. BRIGGS: After he found out that I was on my last and final strike, he kind of just, like, moved in my house (laughter), just came. And it's, like, you know, really messed up situation because it's, like, OK, at this point, what do I do? FESSLER: She definitely could not call police. Since the Briggs case was settled two years ago, Norristown has taken a new approach to addressing nuisance properties. Municipal administrator Crandall Jones says police and other local agencies now work more closely with residents to try to address the underlying problems that lead to excessive police calls such as drug trafficking, domestic abuse or mental illness. CRANDALL JONES: That nuisance issue is really symptomatic and not the issue. And so you know, when you're dealing with the symptoms and not the real issue, the symptoms are going to continue to reoccur and reoccur. FESSLER: He says the borough has seen a huge drop in crime as a result. For her part, Briggs no longer worries about eviction. She now owns her own home. Pam Fessler, NPR News. Transcript provided by NPR, Copyright NPR.